There is a clear conspiracy to deny the existence of UFOs. The mainstream media has misinformed us for years about UFO studies conducted by highly regarded scientists associated with some of the finest universities in the country. There is significant evidence that the U.S. government has covered up the alien presence through misinformation, distortion, obfuscation, and ridicule. Some prominent, politically connected scientists have engaged in the cover up. And a few professional writers have helped to successfully label any scientists who have been persuaded by the evidence and brave enough to take a stand as unscientific charlatans, fanatics, and kooks. 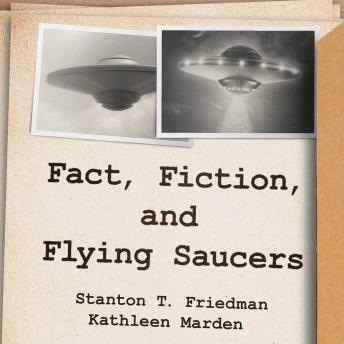 Fact, Fiction, and Flying Saucers examines the wealth of archival documents that clearly demonstrate this cooperative disinformation effort and refute the false claims made by these professional scoffers. Stanton T. Friedman and Kathleen Marden set the record straight by examining politically motivated misinformation and presenting compelling evidence that separates fact from fiction.